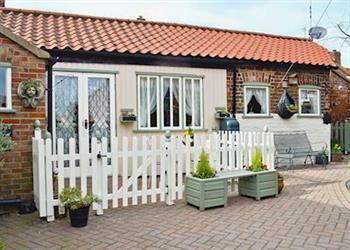 Alpine Lodge in Burgh le Marsh, near Skegness sleeps 2 people. Alpine Lodge near Skegness is tucked away in the centre of Burgh le Marsh, just a short walk to the market place and all the shops, pubs and restaurants; this single-storey lodge adjoins the owner’s home. Alpine Lodge is ideal for those looking for a relaxing break or a base from which to explore this area of Lincolnshire. Just 4 miles from Skegness, with all the fun of the fair, cinema, nature park at Gibraltar Point and lovely sandy beaches. Gunby Hall (National Trust) is 3 miles and a brewery tour at Batemans Brewery in Wainfleet (4 miles) is worth a visit. Horncastle’s antique emporiums and walking in Tennyson Country are also within easy reach. Take a scenic drive to the historic, cathedral city of Lincoln, across the beautiful Wolds with an abundance of shops, bars and restaurants. There are two golf courses and horse riding within 5 miles and fishing ½ mile. The beach is 5 miles. With a shop, pub and restaurant 100 yards from Alpine Lodge near Skegness. Alpine Lodge is all on ground floor: Living/dining room. Kitchen. 1 double bedroom. Bathroom with shower over bath and toilet. Gas central heating, electricity, bed linen and towels included. 32 Freeview TV. DVD. CD. Electric cooker. Microwave. Washing machine. Fridge/freezer. Enclosed courtyard to front with sitting-out area and furniture. Parking (1 car). Welcome pack. No smoking. Holidays at Alpine Lodge run from Friday to Friday. For a better idea of where Alpine Lodge is, you can see Alpine Lodge on the map below. Alpine Lodge is in Lincolnshire; should you be on the lookout for a special offer, you can find all the special offers in Lincolnshire. It's always worth checking to see what is on offer at the moment. Do you want to holiday near Alpine Lodge (W44068), you can see other cottages within 25 miles of Alpine Lodge; have a look to find your perfect holiday location.